Executive power is exercised by the executive, headed by the President, advised by a Cabinet of Ministers. The President is both the head of state and the head of government. Legislative power is vested upon the National Congress, a two-chamber legislature comprising the Federal Senate and the Chamber of Deputies. Judicial power is exercised by the judiciary, consisting of the Supreme Federal Court, the Superior Court of Justice and other Superior Courts, the National Justice Council and the regional federal courts. The Chamber of Deputies (Câmara dos Deputados), which has 513 seats. Federal deputies are elected by proportional representation to serve four-year terms. There are no limits on the number of terms one may serve for either chamber. The seats are allotted proportionally to each state's population, but each state is eligible for a minimum of eight seats and a maximum of 70 seats. 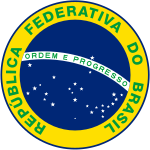 The result is a system weighted in favor of smaller states that are part of the Brazilian federation. Currently, 15 political parties are represented in Congress. Since it is common for politicians to switch parties, the proportion of congressional seats held by particular parties changes regularly. To avoid that, the Supreme Federal Court ruled in 2007 that the term belongs to the parties, and not to the representatives. Brazilian courts function under civil law adversarial system. The Judicial branch is organized in states' and federal systems with different jurisdictions. The judges of the courts of first instance take office after public competitive examination. The second instance judges are promoted among the first instance judges. The Justices of the superior courts are appointed by the President for life and approved by the Senate. All the judges and justices must be graduated in law. Brazilian judges must retire at the age of 70. The national territory is divided into five Regions, which are composed of two or more states. Each region is divided in Judiciary Sections (Seções Judiciárias in Portuguese), coterminous with the territory of each state, and subdivided in Judiciary Subsections (Subseções Judiciárias), each with a territory that may not correspond to the states' comarcas. The Judiciary subsections have federal courts of first instance and each Region has a Federal Regional Tribunal (Tribunal Regional Federal) as a court of second instance. There are special federal court systems, such as Labour Court (Justiça do Trabalho) for labor or employment-related matters and disputes, Election Justice (Justiça Eleitoral) for electoral matters, and Military Justice (Justiça Militar) for martial criminal cases, each of them with its own courts. There are two national superior courts that grant writs of certiorari in civil and criminal cases: the Superior Justice Tribunal (Superior Tribunal de Justiça, STJ) and the federal supreme court, called the Supreme Federal Court (Portuguese: Supremo Tribunal Federal). The STJ grants a Special Appeal (Recurso Especial) when a judgement of a court of second instance offends a federal statute disposition or when two or more second instance courts make different rulings on the same federal statute. There are parallel courts for labor law, electoral law and military law. The STF grants Extraordinary Appeals (Recurso Extraordinário) when judgments of second instance courts violate the constitution. The STF is the last instance for the writ of habeas corpus and for reviews of judgments from the STJ. The superior courts do not analyze any factual questions in their judgments, but only the application of the law and the constitution. Facts and evidences are judged by the courts of second instance, except in specific cases such as writs of habeas corpus.